Official artwork of Sukapon from Joy Mech Fight. Sukapon (スカポン, Sukapon) is the main character of Joy Mech Fight. 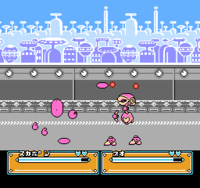 Sukapon as it appears in Joy Mech Fight. Sukapon was made by Dr. Little Emon and Dr. Ivan Walnuts. When Dr. Walnuts declared his intent to rule the world, Dr. Emon used Sukapon to defeat Dr. Walnuts's robots and stop his evil scheme. After an epic battle on the moon and a change of heart by Dr. Walnuts (apparently due to a split-personality), Sukapon returned to a career as a stand-up comedian. Sukapon is the most basic robot playable in Joy Mech Fight with the most basic of attacks, and so it is mostly played by newcomers and those looking for a challenge. Its specials consist of a suplex-like throw, a rolling attack which can be executed in a variety of ways (including a glowing, powerful jump-attack if a secret input is quickly pressed), and two head-tossing moves: one of which can be used for movement, and one of which is a projectile. Its most distinctive feature is that it has the same speed whether walking forward or backward; though a relatively slow speed going forward, it is rather fast for backing up. Sukapon was originally going to be an item in Melee, and would have been able to be jumped on by characters, but was cut for "adult matters". Using Tondeker against Ryu in Super Smash Bros. Ultimate. Sukapon appears as an Assist Trophy in Ultimate. It moves around the stage while spinning around with its arms raised and can jump, flailing its hands whenever airborne. It attacks by using its special move, Tondeker, which shoots a copy of its head at opponents. It uses a second special move, Sukapon Toss, where it uses a close command grab then tosses opponents backward. It also uses a third special move, Sukapon Roll, where it rolls its whole body forward fast, then continues to spin when rebounding off opponents. Sukapon can also block attacks just like in Joy Mech Fight, but is still vulnerable to grabbing. Sukapon has small black dots for eyes but will have a circle surrounding the dot when attacked or in its Tondeker head projectile, giving off a surprised expression. It claps its hands and moves its feet side to side when finished, a reference to its victory animation in Joy Mech Fight. Like many Assist Trophies in Ultimate, it can be defeated. Training Mode describes its Assist Trophy: Spins around and tackles opponents, occasionally chucking its own head. Sukapon is also a Legend-class spirit, available in the Spirit Board or in the shops. Its spirit fight is a stamina battle against Mii Gunner (meant to represent Dr. Little Emon), whose attack power periodically increases, on Coliseum, with Sukapon constantly appearing as a hostile Assist Trophy. Sukapon as an Assist Trophy in Super Smash Bros. Ultimate. Sukapon, as it appears in Super Smash Bros. Ultimate. Using its Sukapon Toss against Luigi. This page was last edited on February 18, 2019, at 04:19.